Don’t feel bad. As below it wasn’t directed at people I know. Clearly I need to rethink what I said. And clearly I’m not doing a good job if I can say all that stuff and no one has a response! Oh well. What about when I have nothing to say? I’m not ALWAYS witty, you know…. It wasn’t directed at people I converse with already, actually. More the ones I’ve never seen before who like and say nothing at all. Comment, people! Make me want to come visit your blog, too! Week after week, I try to get people to leave comments below my articles, and you know how well it works… I’m totally with you on that, but I guess there’s nothing we can do. Some people like to read and never comments. And sometimes you have that very new visitor which decides to talk without having been asked to. (Hug) Thanks. I still haven’t read your last post – I’m about 70 emails behind. Fuuuuuuuck. Haha it’s okay! By reading them late, you give a longer life to my posts. After all the subscribers went through them, all I get are hits from random Google users (and sometimes from odd unpopular bloggers who decide to randomly link to a post as a source). Actually I’m quite short on time too these days, so I basically try to catch back on one of the blogs I’m subscribe to any time I have a few minutes left — I’m catching up on Sled right now. Actually, that is a pretty boring set of stories. I have a “super-sniffer” nose, so I can’t deal with decomposition very well. But I have a friend in Alaska who owns her own carrion beetles solely for cleaning animal skulls. She’s considering setting up a YouTube channel for all the neat things she does, and this would be one of the neat things. Oh! The person I talked of used chemicals to do the task. I guess looking at the bugs doing their job might be… interesting (trying not to make myself any mental image right now). I usually let nature do the job. If a bit … meaty… I’ll use bleach. I’ll do a post. One of the best parts of having woods and fields as a kid was the “leftovers” all cleaned and ready to take home…we marked trees sometimes and came back after finely bleached by sun. Can you show more pix of the pottery? very cool. I can’t throw a pot worth a darn – quite a skill…not to mention the glazes. Glad to know about the LED candles – I’d dismissed those, but may have a look now. You sound more like a fall person than a spring sprite…spring is OK fine at first – but then the long days of scorching sun and oppressive heat just does me in. Hi! I didn’t comment on your post because my big love was the dogwoods – not the point of the post at all! But they are lovely. It’s the time of year here for the narcissus and daffodils – they are out in force! If kept dry-ish and cool for a few months they will bloom. A month in the fridge will get hyacinths to grow. I just love the way they smell – why don’t I have any?!? I think I’ll put a smaller pot with holes inside the wee can – it sure isn’t suited for those long leggy plants. I have several chunks of Jade plant that will love it in there! Damn dog keeps breaking off bits of my ginormous momma plant. As they do! I’d LOVE to share the pottery! I have a good bit – I used to have more but Spot’s mother jumped six feet straight UP and slammed into a shelf where I had it all. My downstairs neighbour said it sounded like a bomb went off. Aargh! Apparently they make a tea light version of the candles – slightly safer within reach of big saggy tails, as they are glass. Kitties have knocked the tall ones over a few times, onto stone, and they didn’t shatter. That’s a plus for me, too. Yes, those boxes are great! I have one of the pyramids that I “charge” stuff in. 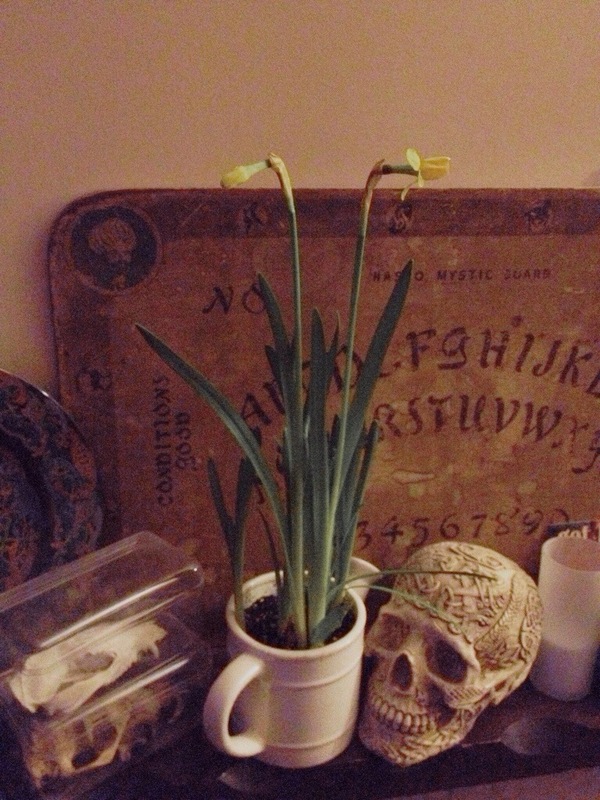 Love the ouija board, and you’re lucky to have the blooms. Nice post. Pyramids? Do you have the Phillips lights too? They are kind of a triangle thingie… I’m so very tech, aren’t I? Ha! No.. not familiar with the Phillips lights. I was talking about the Ferrero Rocher pyramid boxes. Haven’t seen them for a long time, though! Oh! I don’t think I’ve ever seen those! Might be a holiday thing, pile them up like a Christmas tree? I get made fun of for saving a lot of weird stuff, but those boxes are so great for keeping dust off of things you can’t, or don’t, want to dust! I’m sure it was a holiday thing, and I haven’t seen them for a while now. Yeah, there’s all kinds of stuff here that is just going to be perfect for um… something!